Steel mesh manufacturer Zaun has created an innovative high-security weldless mesh panel upgrade to steel Palisade fencing. Research and development manager Adam Christie has devised an ingenious fastening method to allow installers to fix Zaun’s ArmaWeave fencing panels to existing Palisade posts and horizontal rails. So long as the existing Palisade posts were installed to British Standard 1722, they are sufficient to support the ArmaWeave upgrade as the wind loading is almost identical. The fixings also use the existing bolt holes in the horizontal rails so all that is needed is to drill six holes in the posts to secure vertical clamping members. The vertical members can be extended to allow for a wide range of toppings, including concertina razor wire and electric fencing. As ArmaWeave is self-raking, it mimics the functionality of Palisade – and the panels can be manufactured to match the height of the existing Palisade fencing. Christie says: “It’s eco-friendly and highly cost effective as it requires minimal groundworks, no spoilage and no plant to dig holes as it utilises the existing posts and concrete foundations. 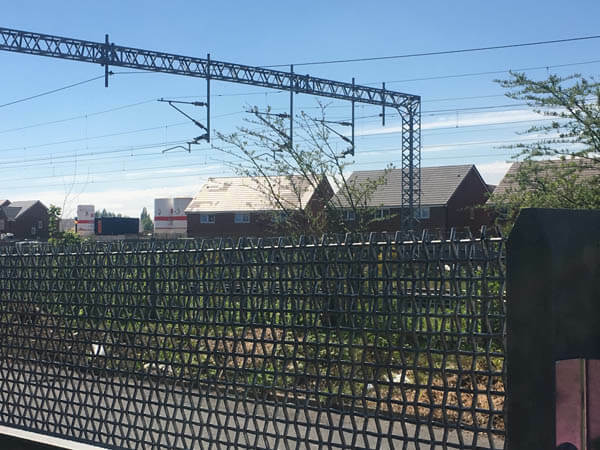 Four companies are accredited to install ArmaWeave – Allens Total Perimeter Security, Zaun subsidiary Binns Fencing, JB Corrie and Crime & Fire Defence Systems. All have committed to training their site operatives in the installation methods for ArmaWeave developed by Zaun over time to make best use of its unique high-security woven fabric. Zaun established the installer scheme after increasing requests from customers to recommend contractors with suitable installation, quality and safety standards. ArmaWeave is produced on the world’s largest steel loom at Zaun’s West Midlands manufacturing base. It has unique properties that give it distinct advantages against more traditional welded mesh systems, such as panels that can be raked to accommodate slopes. Therefore, installers require the necessary skill sets to set this up. The wire of the panels has a tensile strength typically more than double welded panels so special methods are needed for cutting the panels during installation.